Last year's Betfred Cup runners-up Motherwell got off to a fine start to this season's competition with a resounding Group G home win over Edinburgh City on Tuesday evening, writes Craig Goldthorp. The Steelmen went one up on seven minutes when Elliott Frear tapped home at the back post after great wing play on the right by Chris Cadden. It was 2-0 on 17 minutes when captain Richard Tait scored with a low shot from outside the box. 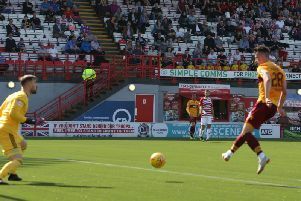 And the Steelmen were out of sight when Frear shot in with his left foot on 23 minutes after Curtis Main's initial free-kick had been blocked. Andy Rose soon missed a left footed sitter after Main's cross from the right. But it was 4-0 Motherwell after 27 minutes when Frear shot in with his left foot for his hat-trick. Cadden shot wide with his right foot as the hosts continued to lay siege to the City goal. There was a close call when Tait passed to Main whose blistering right footer from the edge of the box was tipped over by keeper Calum Antell. With the game effectively over at half-time, Motherwell made an interval substitution with Spaniard Alex Gorrin coming on for Chris Cadden. New signing Conor Sammon then came on for his 'Well debut as a 63rd minute substitute for Ryan Bowman. And there was another attacking change for the Steelmen as Danny Johnson replaced Main on 67 minutes. If the first half featured non stop action and goals, the second half was very dull by comparison. Liam Donnelly blasted an effort high and wide for the hosts before Charles Dunne lost possession at the other end and City sub Allan Smith shot wide. Sammon powered forward on 83 minutes but dragged his shot weakly off target with the final meaningful chance. Motherwell will play their second group stage match at Stranraer this Saturday. Motherwell: Gillespie, Tait, McHugh, Cadden (Gorrin 45), Campbell, Main (Johnson 67), Frear, Bowman (Sammon 63), Rose, Dunne, Donnelly.